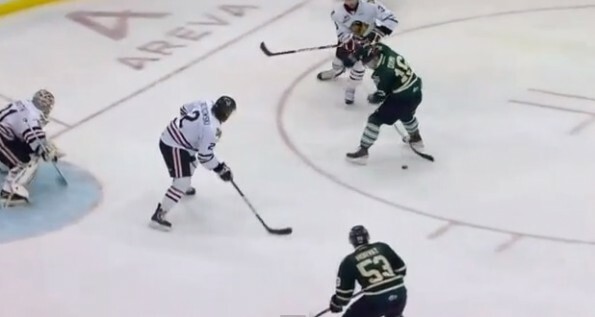 The London Knights of the OHL didn’t win their Memorial Cup round robin game against the Portland Winterhawks on Monday, but if it’s any consolation, they didn’t fail to impress during their 6-3 defeat, either. Specifically, we’re referring to Knight’s forward Max Domi, son of former NHL tough guy, Tie Domi. With London trailing by a score of 3-1 in the second period, Domi took a feed in the slot and delivered a through-the-legs saucer pass across the Winterhawks goal and on the tape of Bo Horvat‘s stick for the highlight reel assist. Unfortunately for the Knights, sweet-looking goals like this one have the same value as all other goals. And they didn’t get enough of either on this occasion.